The constructions from glass and metal occupies about 3800 m². The precinct shelters remarkably plants collections (approximate 2600 taxa) native especially of sub-tropical, tropical and equatorial zones of the globe, from all the continents. Their distribution is realized taking into account well defined criteria: bio-geographic, taxonomic, utilitarian etc. The complex includes 12 greenhouses, each of them having their characteristics and containing various plants species. Greenhouses 3, 4, 5, 6, 10, 11 and 12 are used exclusively for scientific research and prepare reproducing material. That is why these greenhouses are not opened for the visitors. No. 1 greenhouse contains the xerophilous plants collection. The species placed in the central space of the compartment creates a heterogeneous taxa association, presenting arboreal aspect and corresponding to one elective criterion: all of them are species originating in zones presenting sub-tropical (Mediterranean) climate (they grow in natural conditions in the territories situated around the Mediterranean Sea; also by climatic analogy, in the NV of California, Chile, South Africa). Most of these taxa are very well known: Mediterranean fan palm, olive tree, pomegranate, fig tree, carob, laurel tree, oleander, rosemary, cypress, bay, butcher’s broom, etc. Here, the valuable collection of plants with bulbs, rhizomes and bulbotubers can also be admired, collection including taxa prevalently included in three botanic families: Liliaceae, Amaryllidaceae and Iridaceae. 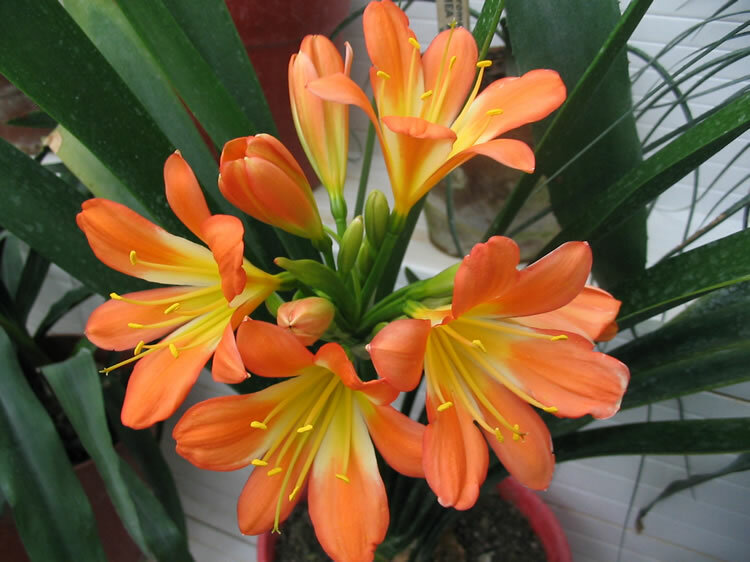 A positive impression is induced by the decorative qualities of the great inflorescences, persisting in time of the African lily and clivia species. Solitary or grouped flowers, in pastel colours of Zephyranthes candida, Zephyranthes grandiflora and also the colours, forms and size of the leafs of some species as Haemanthus albiflos (ear of the elephant), Ledebouria socialis, Eucomis comosa are completing the image of no. 1 greenhouse. No. 2 greenhouse presents a heterogeneous structure. The majority of the representatives belong to the Palmae botanic family. These and other specimens situated in other spaces of the greenhouses complex (no. 8, 9 and 11) forms the palms collection of the Botanic Garden. The date palms, Mediterranean fan palms, ornamental palms (originating in California), Phoenix roebelenii (native from India and China), Caryota mitis (originating in Malaysia) represents only few of the 50 species that are constituting the palm collection. The greenhouse includes also representatives from Cycadaceae family, primitive forms in actual gymnospermes background. The most spread species of the Cycas genus is Cycas revoluta, originating in Japan. The collection includes other representatives of the family: Ceratozamia mexicana (originating in Central America), African species Encephalartos ferox and Stangeria eriopus. Some specimens from the enumerated genera (Cycas, Encephalartos, Ceratozamia) have flowered in the greenhouses of Botanic Garden Iasi, phenomenon presenting a rare occurrence in culture conditions. In no. 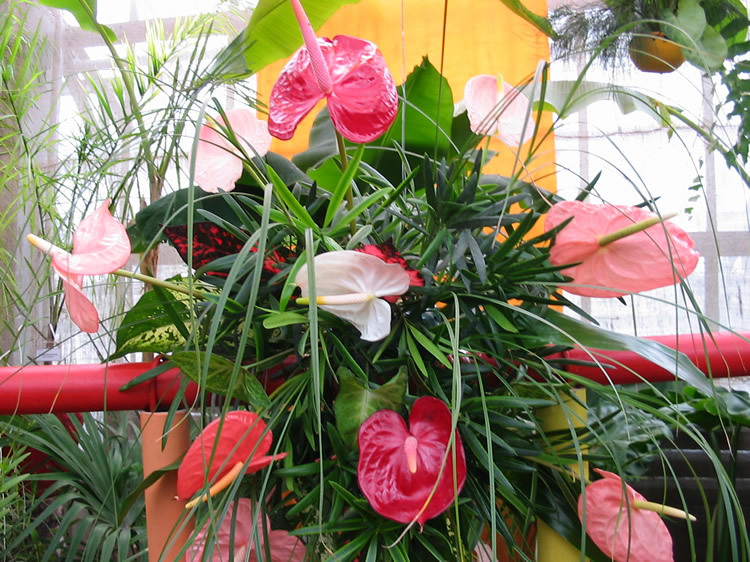 3 greenhouse are cultivated plants originating in the tropical zones of the globe. Here can be admired the epiphytes collection – plants presenting a particular way of life, significant for the capacity of adaptation imposed by the conditions characteristic to their natural environments (for example, rainforests where the light is showing a deficit). The orchids have a wide spreading area and can be met preponderantly in tropical regions of Africa, America and Asia. 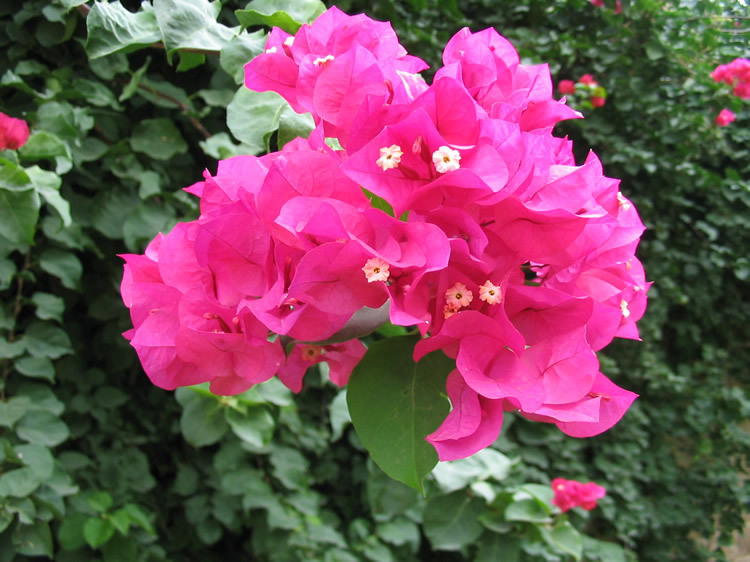 These plants attracts especially by their perfume, colour, forms and proportions. 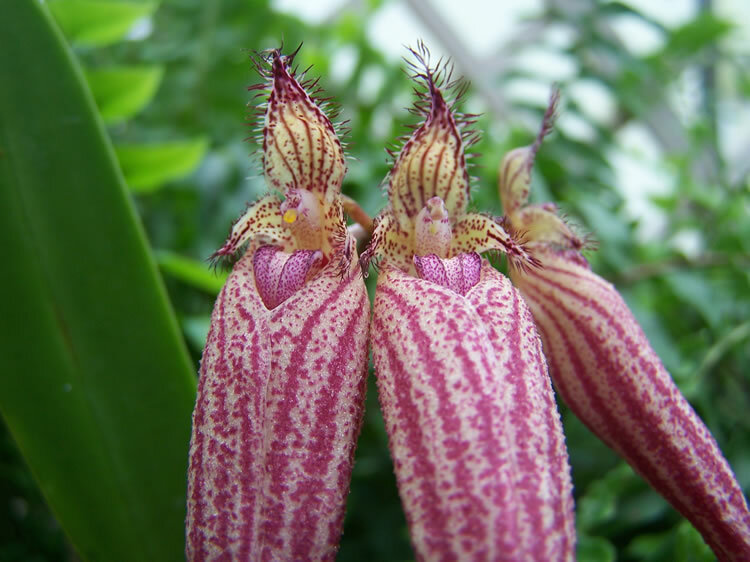 In our greenhouse can be admired over 60 species and hybrids, most of them epiphyte, some presenting a series of adaptation curiosities: the existence of foliar bulbs assuring the water reserves or roots exposed to the air presenting an tissue that absorbs the pluvial water. Most of the epiphytes exposed in no. 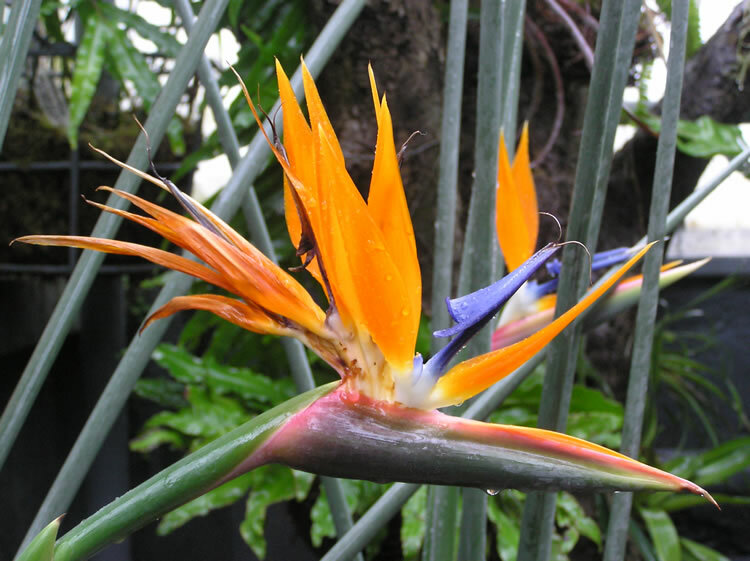 3 greenhouse are species from Bromeliaceae family, the visitor being impressed by the decorative aspect of their leafs. Beside them, can also be remarked a series of epiphytes and lianas from Araceae family (famous by the variety of size and colouring of leafs), ferns (Pteridophyta – some having tropical origin) and insectivorous plants. The last of them are distinguishing by their adapting qualities transposed in the nutrition mode: because they are usually living in environments poor in nutrients, they are completing the "food" obtained by photosynthesis from substances having mineral origin with another type of "food", by organic origin, obtained through the decomposition process of the substances that are composing the body of some animals, especially insects. From 535 species of carnivorous plants known in the globe flora, in Romania only 10 are growing (from Drosera, Aldrovanda, Pinguicula and Utricularia genera). Also, the greenhouse shelters collections of plants decorative by leafs: Begoniaceae, Commelinaceae families etc. No. 4 greenhouse shelters collections of plants originating in the tropical zones of the globe, notable by the ornamental aspect of the flowers and leafs. For example, Anthurium scherzerianum presents an inflorescence very attractive by its configuration and bright colouring (red – carmine) of spadix and spathe. Also, the beauty of A. hookeri, A. leuconeurum and A. warocqueanum taxa is assured by certain particularities of their great leafs, intense green coloured and having velvety aspect. In no. 4 greenhouse can also be admired over 20 taxa from Calathea, Ctenanthe, Maranta, Stromanthe and Thalia genera (Marantaceae family), over 15 cultivars of Codiaeum variegatum var. pictum (Euphorbiaceae family) and a series of taxa from Liliaceae family. Additionally, the visitors can admire here perhaps the most interesting tropical plant, Mimosa pudica, species attracting by its delicate pinnate leafs which are proving a surprising sensibility, executing nyctinastic (in accordance with the alternation day / night) and seismonastic movements (provoked by light touches). No. 5 greenhouse attracts visitor's interest in the winter season; it is destined to protect some bushy species – azaleas and camellias. 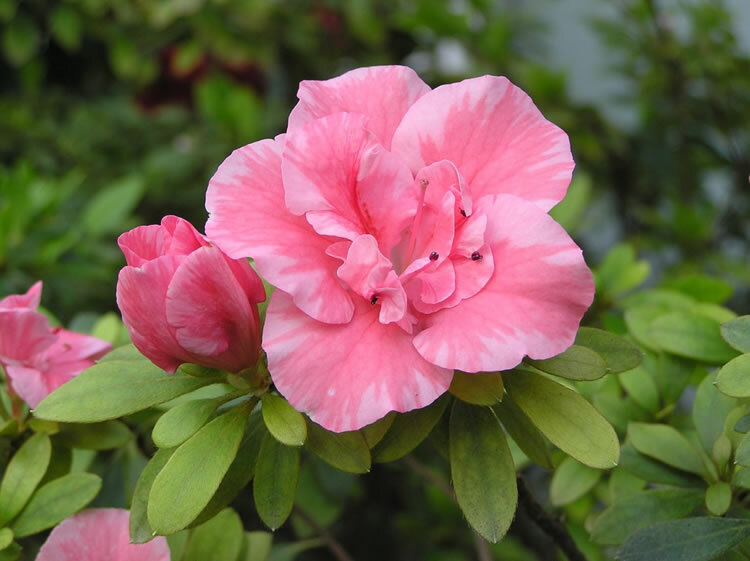 Azaleas have the origin in the mountain regions of S-E Asia, only few originating in North America and Europe. 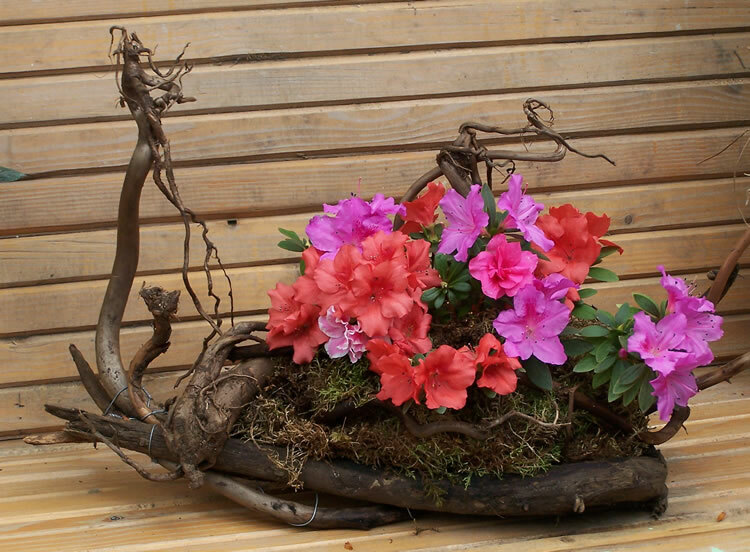 In the Botanic Garden of Iasi, 35 varieties of azalea can be admired. 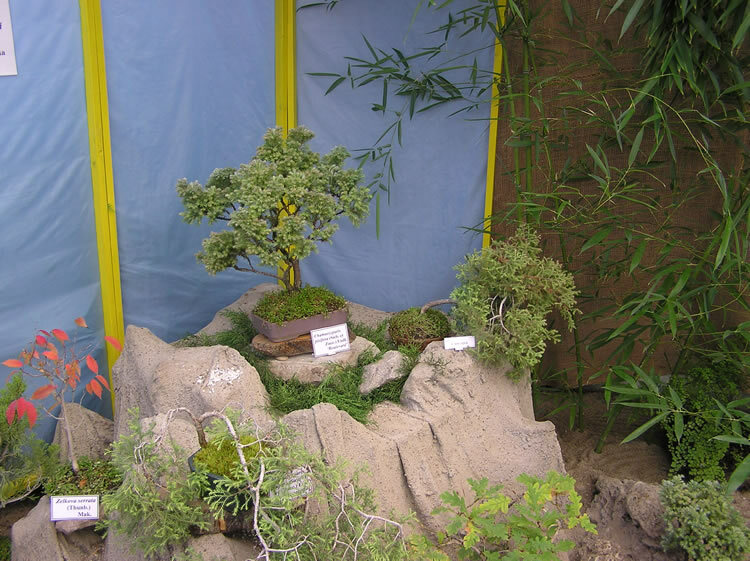 The shrubs are presented in cultivation vases (pots or pails) and have a size until 2 m height. The leafs are persistent and the flowers generally displays a great diversity of aspects: trumped or urceolate, simple corollas or presenting many ranges of petals, having undulated or fringy petals margins, solitary or grouped and a very varied line of colours: bright red, brick – coloured, violet with white indented margins, pink knurled with white or immaculate white. The plants composing this collection flower in December – March period. Camellia genus includes approximately 80 species naturally spread in S-E Asia. Among that, the tea shrub (C. sinensis), originating in China, is one of the most popular species. Our collection includes 10 varieties of Camellia japonica species. Its origin is extreme – oriental (Korea, Japan, N of China), where it presents a bushy or arboreal aspect (until 15 m height). The leafs are evergreen, bright and the flowers have big size, waxy petals arranged in scales forms and are varied coloured (white, red, pink or immaculate). No. 6 and 7 greenhouse offers the appropriate background for the cultivation of species that are composing the succulent plants collection. Although these species belongs to different botanic families, they have a series of essential commune characteristics: retains and accumulates water in their vegetative organs. Most of the cactuses cultivated here are specific to the desert or semi – desert areas from North and South America. The species from Cactaceae botanic family presents a interesting geometry of forms and diverse particularities regarding the aspects and the insertion of prickles, the delicacy and the colouring of the flowers. Between all these, we can remark species from Astrophytum, Lobivia or Rebutia, Gymnocalycium genera etc. Other representatives of Echinocereus, Echidnopsis and Mammillaria genera are completing the general aspect of no. 6 and 7 greenhouses. The economic value of plants as the Cactaceae is well known. The fruits of some species from Opuntia genus (Indian fig) or from Cereus, Echinocereus genera have diverse usages, both for humans or animals (from specimens of Opuntia and Selenicereus are extracted juices that are efficient in the treatment of various diseases). species from Lithops genus (Aizoaceae family). Having African origin, they are distinguishing by their low, broadened, pulpy, bi-lobed stems. The flowers are intense coloured and present a evanescent existence. No. 7 greenhouse is circumscribed to the same theme as the precedent. In its central part are exposed great size specimens, distributed in accordance with their origin: American and African. Also, species presenting reduced size can be admired. species from Aloe genus: A. variegata, A. virens, A. ferox, A. saponaria and Sansevieria genus (snake tongue). No. 8 greenhouse offers the possibility to know various useful species originating in tropical and sub-tropical areas. Some specimens of date palm (Phoenix dactylifera) contribute to the realization of an exotic ambient, attractive to visitors. Most of the plants present here have edible fruits. medicinal and aromatic plants: camphor tree (Cinnamomum camphora), clove tree (Eugenia caryophyllata), pistachio tree (Pistacia vera) etc. Nr. 9 greenhouse, called also the Tower greenhouse is a circular construction, placed in one of the extremes of the administrative building. The access inside is realized straight from the central hall by a connection corridor. Here are cultivated great size vegetal taxa, presenting luxuriant growth as date palm Phoenix dactylifera (fam. Palmae) that edifies the African deserts oasis. Other specimens from the same family, but smaller in stature are: Trachycarpus fortunei (fan palm), Chamaerops humilis (Mediterranean fan palm), Washingtonia filifera. These species are used in the aestival season to decorate the exterior greenswards of the Botanic Garden. magnolia (Magnolia grandiflora), is a tree originating in North America, presenting a straight trunk, abundant ramified in its superior part; great, evergreen leafs and white, large (15-20 cm diameter), strong smelling flowers. Tetrastigma voinierianum, a decorative tropical liana. No. 10 greenhouse is a space presenting a special destination: here are realized the multiplication operations of different taxa procured from diverse sources (trades with similar institutions, foreign growers or from our country, autochthonous material procured from field trips, etc.). The main destination of this precinct is justified also by the existence of some special scientific interest plants collections (Acanthaceae, Begoniaceae, Moraceae families) used as material and experimental basis for the observations realized by the speciality staff. Citrus, well represented and known, having great economic value: lemon tree (C. limon), orange tree (C. sinensis), mandarin tree (C. reticulata) and other: C. x paradisi, C. maxima etc. No. 11 greenhouse is large size hall (400 m² area, 8 m height) that offers the appropriate space for the presentation of great growth plants and is destined specially to the culture of sub-tropical species, most of the presented taxa originating in boreal and austral regions of Asia, Australia and New Zealand. Although they presents floristic specificities characteristic to these zones, some morphologic features draw them near to the representatives of the Mediterranean vegetation: evergreen, rigid leafs, some presenting glossy surface, other having acicular form. palm trees originating in China and Japan – Trachycarpus fortunei (fan palm), Archonthophoenix cunninghamiana, Caryota mitis etc. No. 12 greenhouse is not destined (exception a part of it) to a permanent vegetation arrangement. Presenting an extended utile area (approximate 700 m²) it has been conceived mainly to periodical expositional events. The central space preponderantly assures appropriate presentation conditions favoured also by the two level conception of the inferior plan. Some specimens present in no. 12 greenhouse constitute elements of the vegetal background adjacent to expositional space. Here, representatives with different origins can be met: Mediterranean origin (Olea europaea), sub-tropical origin (Trachycarpus fortunei) etc. Many specimens existing in no. 12 greenhouse are used during the aestival season to decorate other places or sections of our Botanic Garden.